Earlier, search gaint have accidently disclosed the launch of Android M at I/O 2015, and now here is another thing that came forward which is coming to newest Android M.
The new report suggest that Google 'Android M' will have native fingerprint authentication supports. If the fingerprint features comes to Android OS ecosystem; then OEMs will need to include the fingerprint sensor hardware on their devices for it to work. The Apple iPhone 6, Samsung Galaxy S6, Galaxy S6 Edge and HTC One M9 already come with a fingerprint authentication system. Fingerprint authentication will surely help users and developer regarding the security. Days back, Google hinted the new login page for the Gmail, where there was no password option for users. May Google use this fingerprint authentication technology to help users sign in to websites, make Google Play purchases and Google Wallet authentication without entering their passwords. 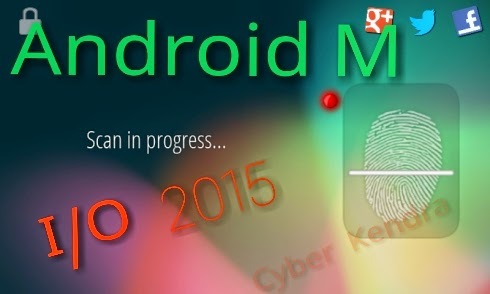 What you think about this Google new step on adding fingerprint authentication on Android OS? Comment below your words.